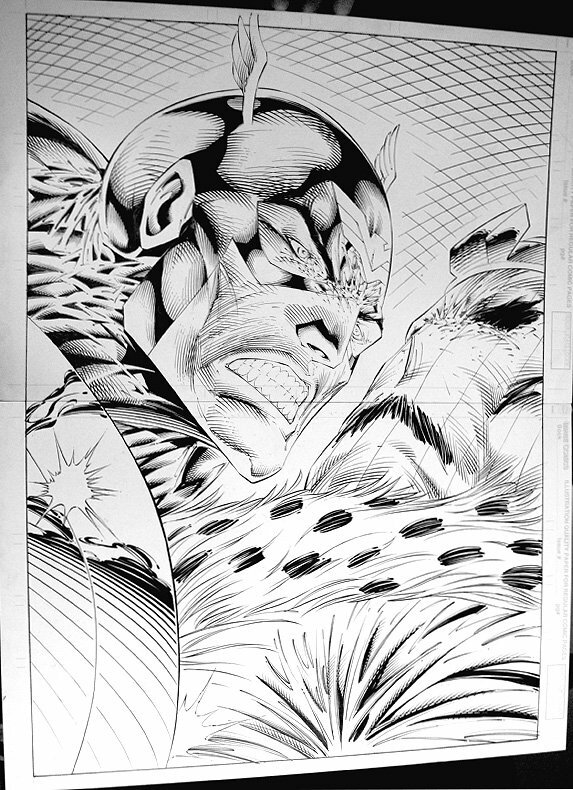 Classic 1996 Double Spread Splash from Heroes Reborn: Captain America #5 by Rob Liefeld. Marvel released this series in the mid 90's with a roster full of their top artists. However, soon after the series began, many of the top guns such as Rob Liefeld and Jim Lee left the series, and it soon fizzled out. However, this is a very fine example of the best art from the Captain America run. It doesn't get much better than Captain America going head-to-head with Baron Zemo. Art is HUGE, drawn on 2 boards and connected, with an actual art image measuring 15 by 21 inches! Try not to miss out on this piece if you can help it. ALL art on our website (including this one) are able to be purchased with VERY fair time payments, and trades are always considered towards "ANY" art on our website! Just send us an email to mikeburkey@aol.com and we can try to work something out.